Why did God create the outer space where the environment is hostile to life? The Bible cannot be looked at as a book about the heavens, but a book about how to get there. The Bible was written by God the Holy Spirit and He inspired all Scripture (2nd Tim 3:16), so the Bible simply says, “In the beginning, God created the heavens and the earth” (Gen 1:1). There is no doubt that God created the earth and the stars, and yes, the universe, including the space between these objects. The Bible speaks about three heavens. The first one is what the birds and the clouds inhabit, the second heaven is where the stars and moon (and space) are, but the third heaven, is not just beyond our solar system or our galaxy, or even beyond the known universe. Heaven must be another realm altogether, although it is a specific place. Are the heavens up or down? If they’re “up” to us, we must remember, it’s “down” for others. We don’t know where heaven is, we only know that it does exist, because that’s where God dwells and today, Jesus is seated at the right hand of the Father, so it must be a real location. We just don’t know what that is. Why would God create trillions of galaxies with even more trillions of stars and planets? Perhaps God has plans for the universe. Right now, it’s not a safe place to be. There are gamma rays, the cold of outer space, no oxygen, asteroids and comets. Life on the other planets we know about cannot support life without a lot of help. What was God thinking when He created all of these heavenly bodies? Was the universe a different place before Lucifer was cast down out of heaven? Was the fall in the Garden of Eden directly responsible for the fact that the planets are in decay and are now hostile environments and cannot support life? Were they capable of supporting life at one time, before Satan and mankind’s fall? What happened? Were they responsible, or have these planets always had hostile environments? No, some scientists say Mars had an atmosphere at one time, meaning it has water, and if there was water, there had to be oxygen, even if a little. We may never know the answers to most of these questions until we see God, face to face. The Apostle Paul wrote “that the whole creation has been groaning together in the pains of childbirth until now” (Rom 8:22), and who could argue that. It’s as if the earth is groaning and moaning as a mother in labor for the redemption of the creation, and right now natural disasters such as tsunamis, earthquakes, hurricanes, tornadoes, volcanoes and other catastrophes could be these groans under the weight of the sins of humanity. In the Old Testament, there is language where God warns the nation Israel that if they fall into idolatry and all the sinful practices that are associated with that, the land would vomit them out as it did other nations, because “the land became unclean, so that I punished its iniquity, and the land vomited out its inhabitants” (Lev 18:25). And so God warns Israel, “You shall therefore keep all my statutes and all my rules and do them, that the land where I am bringing you to live may not vomit you out” (Lev 20:22). Is this what Paul means by writing that the creation has been groaning with “the pains of child birth?” Is this why natural catastrophes occur? We cannot know God’s secret counsel, so really, only God knows that, but there is a biblical history of this occurring, even in reference to Sodom and Gomorrah (Gen 19:23) being judged by God due to the sinful depravity that they had reached (Gen 19:14). I think Paul explains why the creation is groaning, writing “that the creation waits with eager longing for the revealing of the sons of God” (Rom 8:19), “And not only the creation, but we ourselves, who have the firstfruits of the Spirit, groan inwardly as we wait eagerly for adoption as sons, the redemption of our bodies” (Rom 8:23). That could well mean what the Apostle John saw in his vision, where he “saw a new heaven and a new earth, for the first heaven and the first earth had passed away, and the sea was no more” (Rev 21:1). Jesus has promised to make all things new (Rev 21:5), and certainly the universe and the earth are part of “all things.” No one needs convincing that we need a new earth, because “the creation was subjected to futility, not willingly” (Rom 8:20a), but on account of Lucifer being cast down to the earth or when the fall occurred and the thorns and thistles replaced the paradise in the Garden. We are like the creation; we groan for new bodies just as the creation itself does, figuratively speaking. Maybe that’s why the creation waits “eagerly for adoption as sons, the redemption of our bodies” (Rom 8:23b), because the creation itself will be renewed. 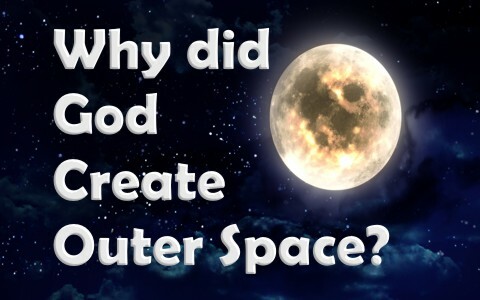 Why did God create outer space? Perhaps so we can see just how vast the universe is, if we can “see it” at all, because it’s so expansive that we still do not know today how big it is and our finite minds cannot comprehend what seems infinite. Since whatever creates something is always greater than that which is created, just imagine the enormity of God. God is always bigger than anything He has created, and since the universe is so vast that our human minds can’t even comprehend it, try to think just how omnipotent (all-powerful) God is! We know that the heavens were created to declare His glory (Psalm 19:1-2), and only a fool who sees the universe would say there is no God (Psalm 14:1), so perhaps the reason there is an outer space is that we here on earth can see just how much like a speck of dust we are compared to the entire universe. The question, “Why did God create outer space” is very much a philosophical one.Why did God create such enormous spaces between heavenly objects? Surely it was to show His glory and His power, but maybe He wanted us to see ourselves as insignificant compared to the universe and compared to Him. Perhaps then we would humble ourselves before His mighty hand. If it only humbles us, that is a good beginning (James 4:6). God created everything for His glory, including us, so those of us who have been brought to repentance and trust in Christ, should glorify God in our thoughts, in our deeds, in our words, and yes, in our bodies (1st Cor 6:20). It’s more than remaining sexually pure though, although that is essential, it’s being a part of the body of Christ, and doing for others (Matt 25:34-39), because as Jesus sees it, “you did it to me” (Matt 25:40). Here is something else that might interest you: Did the Universe Come Into Existence by Chance? Another interesting, inspiring article with Scriptures! Thanks so much, Pastor Jack, for being an instrument of our loving Father God!! Thank you my friend. All glory to God and not to us (1 Cor 4:7). Thank you sir. All glory to God (1 Cor 4:7). Previous post: What Does Redeemed Or Redemption Mean When Used In The Bible?